And you thought Twitter was just for shooting the breeze. In another win for citizen science, a group called Nerds for Nature is asking hikers to shoot images of California's Mount Diablo State Park and post them on social media. 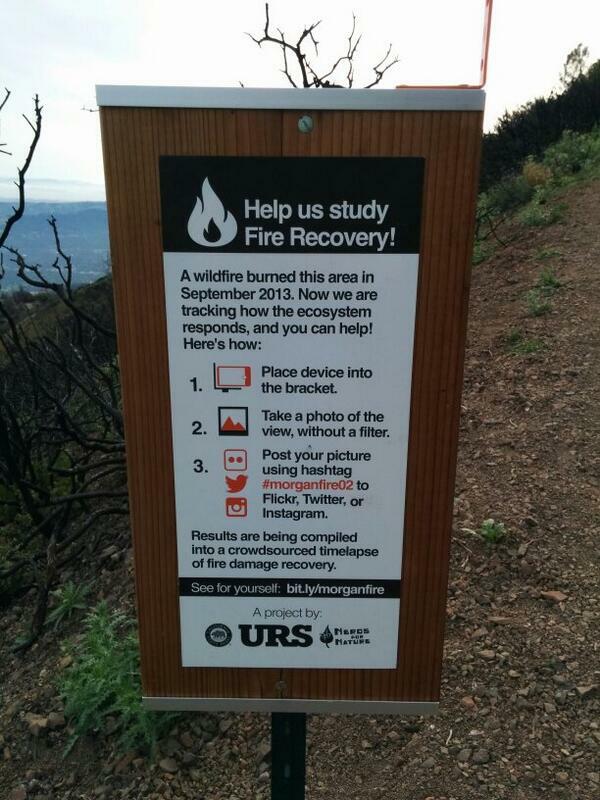 The end result will be a crowdsourced time-lapse showing how the area is recovering from last summer's wildfire. Last September, Morgan Fire burned more than 3,000 acres in Mount Diablo State Park, leaving behind extensive damage on a good portion of the mountain. Almost a year later, things are starting to grow back, Nerds for Nature co-founder Dan Rademacher told KQED Science. Now it's time to keep an eye on exactly what the recovery process looks like. Nerds for Nature set up four signs in different areas of Mount Diablo's Summit Trail, all equipped with brackets to hold a smartphone. Hikers who come across the signs place their phones in the bracket to take a photo of the mountainside. Then they can post it to Flickr, Twitter, or Instagram with a #morganfire hashtag corresponding to the specific area the image came from. Unfortunately, a lot of people seem more preoccupied with posting images of the novel signs than the land itself at this point, but a spreadsheet of contributions shows that users have shot about 300 usable images, and that number is still growing. The aim is to make use of the trail's popularity, which attracts hikers every day, and watch as flora and fauna return to the area. The new project should continue for at least another year. The hope is that eventually the photos could aid scientific studies on wildfire recovery in the park. Quite a contribution for 140 characters or less.